A Week in the Southwest! One thing that will never get old is the handful of times I get to see my best friend Leah every year. We've been bffs for just about 10 years now, and she's the warmest and most caring person I could ask for in my life. Earlier this year, I tweeted about a few spots I was interested in visiting sometime this year in the Southwest USA, and she texted me with the idea of coordinating our vacations to go see everything and I was thrilled! She let me take the reigns on planning (because let's be real, I am obsessed with planning everything from my days off to the next 6 months of my life! ), and I started sending her pictures of places we couldn't pass up. Whoops! After a loooooong year of working 70 hour weeks, 2 jobs and a startup, I hadn't taken a vacation longer than a weekend and needed some time for myself. This vacation was the perfect idea. We even made an Instagram hashtag (#leahandvanswtakeover) that I haven't even posted to because I wound up shutting my phone off for most of the trip. To start our trip, Leah met me at my in-law's house to drop her car off and regroup before we left early the next morning. We grocery shopped, caught up a little, and tried to get to bed a decent hour. We departed around 7:30am the next day, and our only plans were to get to Denver. If you've never been to the Midwest, there is virtually nothing to see between the Rocky Mountains and the Appalachians. The states that lie in the middle are comprised of corn fields, cow farms, and the flattest plains you could imagine. So driving straight through to Colorado was the only option in my mind! Leah began vlogging while she was in the passenger seat, and continued for the entire trip. I can't wait to see the video! After 16 or so hours of switching off driving, we stopped at a cheap hotel and crashed for the night to rest up for the real start of this vacation. Day 2 was a little more exciting, and we started by getting breakfast with my sister-in-law and talking over our plans for the week. After we left, we were heading straight to Aspen to do a quick hike to see Maroon Bells from a distance and to really show Leah to Rockys, as she had never been further west than the Dakotas! We drove 3/4ths of the way to the trailhead and hit a roadblock that there was no way around. It may have been closed for the season, but either way, we were a little bummed. 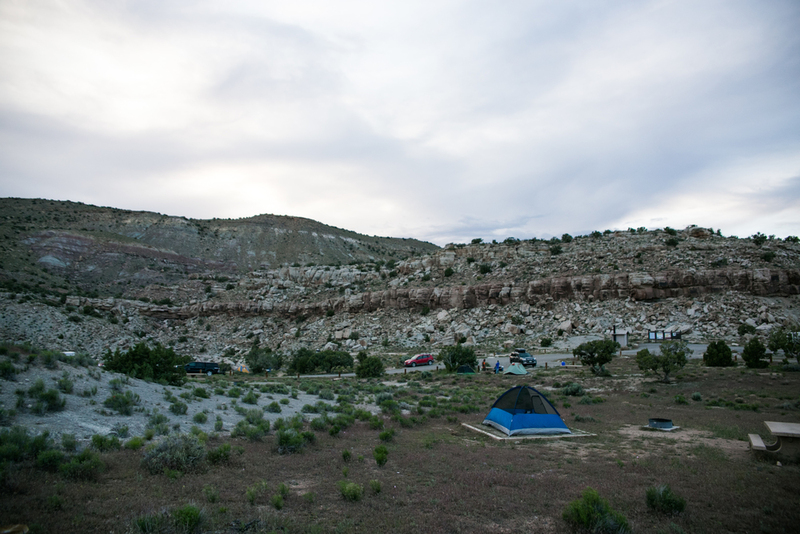 I rerouted us and we headed straight to our campsite in western Colorado a few hours down the road. 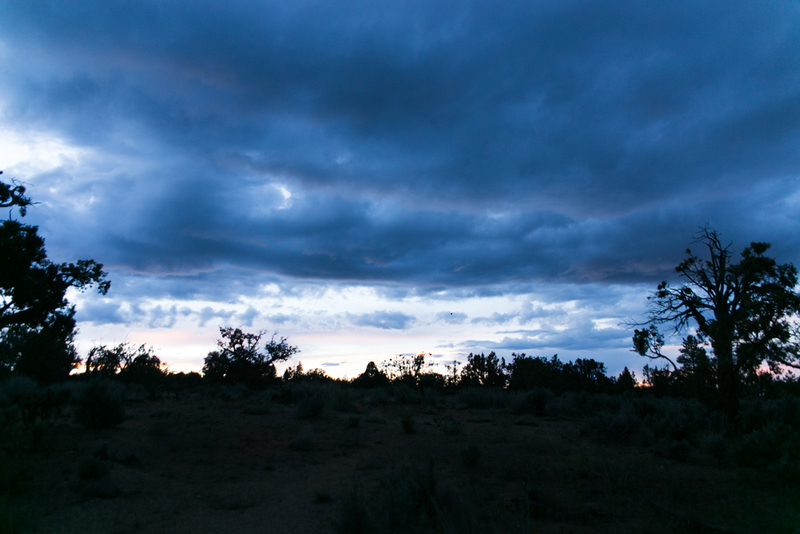 It turned out to be our favorite campsite of the entire trip, and was just a taste of what the Southwest desert is like! We even met a camping neighbor who knows someone from Pewaukee, WI. What are the chances! We explored around the area for a while and planned to do a little hiking in the morning before heading out. Overall, not a bad start to the trip. Day 3 was one of my most anticipated days, and it also wound up being our most laid back day of the trip. After wandering around the area near our campsite for an hour or so, we packed up on got back on the road headed for Moab. We planned to do Arches National Park and see everything we could see, and then head south until we found somewhere to camp. Arches was beautiful and vast and something everyone needs to see at some point in life. It's the most concentrated collection of naturally formed arches in the world, and we got to see a few of the best ones. We drove the entire park, stopped every few minutes to take photos, had a quick picnic lunch in the back of my car, and felt like we saw everything we wanted to. I bought a few postcards to send to my loves back home, and we headed to a not-so-great campsite that we wound up bailing on after a few hours of shivering in our tent and worrying about what wildlife we might encounter if we stay. Nothing like getting a discount a hotel for checking in so late! 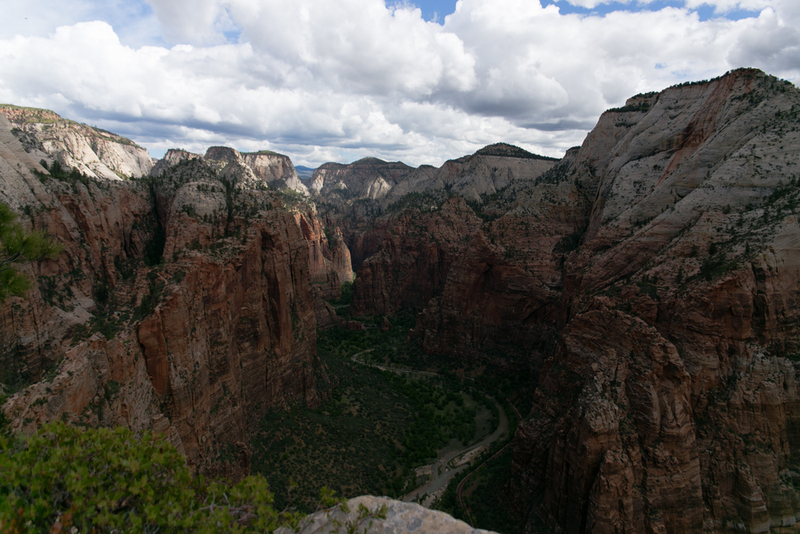 We got some good sleep so we could head to our next stop: Zion! 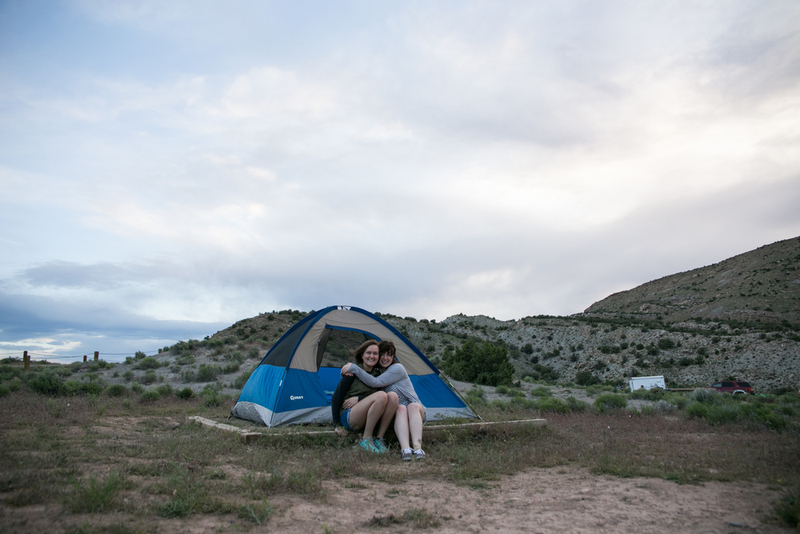 Day 4 started by driving straight to our first-come-first-serve campground in Kanab, Utah. 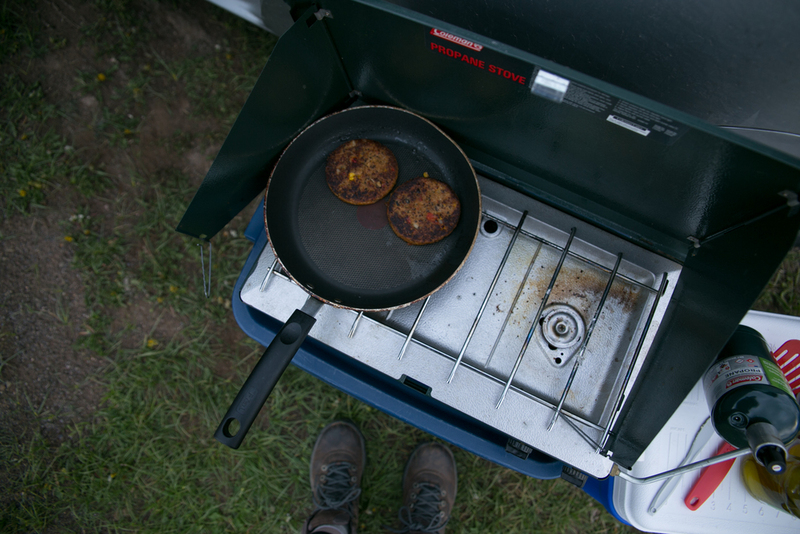 It was pretty empty and rained off and on, but we got set up and were happy to have secured somewhere for the evening. 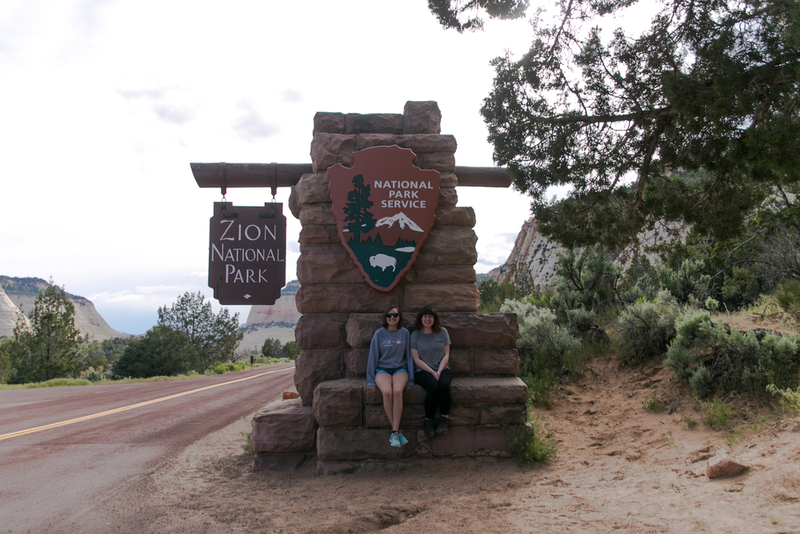 We had half the day left with no plans, so we made the 40-minute drive into Zion and just drove around to see what it had to offer and plan Day 5. I was blown away at the beauty of the entire park, and couldn't stop staring out the window. We got a feel for where things are in the park so we could head straight to the trailhead the following morning. Oh, and saw some buffalo outside the park on our way back! We also got to have a real fire, as a lot of places have burn bans and we were short on firewood. We both had been waiting for a fire to cook over and to just relax by, and this was the perfect night for it. I can't believe how much food I ate. Foil packs are where it's at! We also got to enjoy the conversation of our camping neighbors drunken happenings for a few hours. Overall, one of my favorite nights. Day 5 was the most exciting and completely terrifying day of the trip (for me at least). 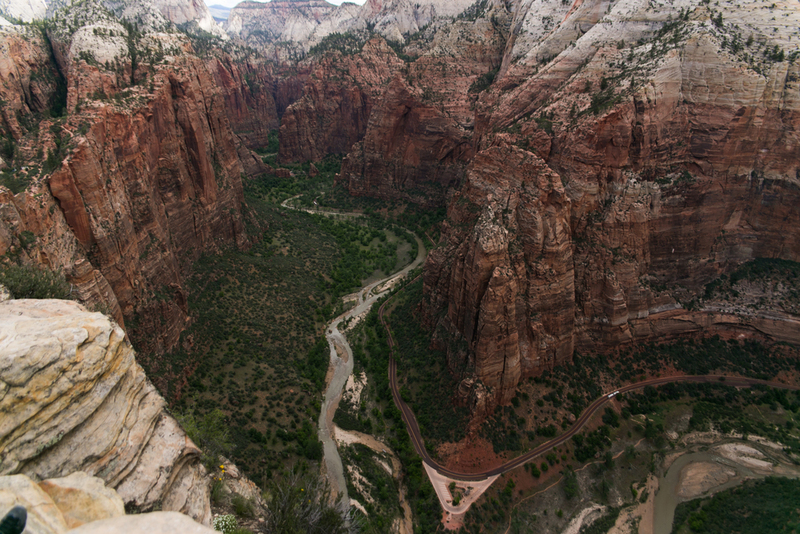 I scouted Angel's Landing a few months before and knew I would do anything I could to climb to the very top. 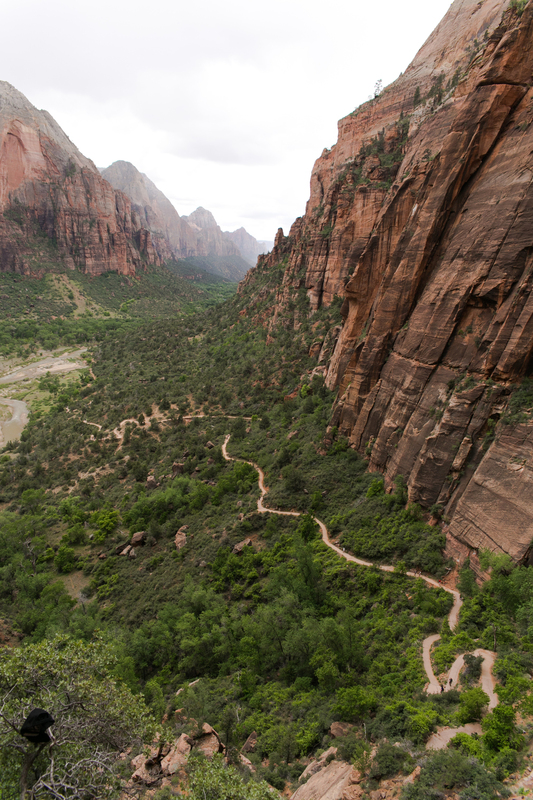 It's not actually a technical climb, but the final half mile requires climbing, scrambling, and lunging on roughly 3 feet of ground, a metal chain, and 1,200ft+ drops on both sides of you. We started out the day early on, as we knew we'd be hiking for about 4 or 5 hours. It was hard to eat that morning, as I was nervous but ecstatic that I'd get to hike something worthwhile for the first time in over a year. We got to Zion and caught the shuttle straight to our trailhead. It was a pretty grueling 2.5-mile hike to Scout's Lookout where most people turn back after snapping a few photos and taking in the scenery. 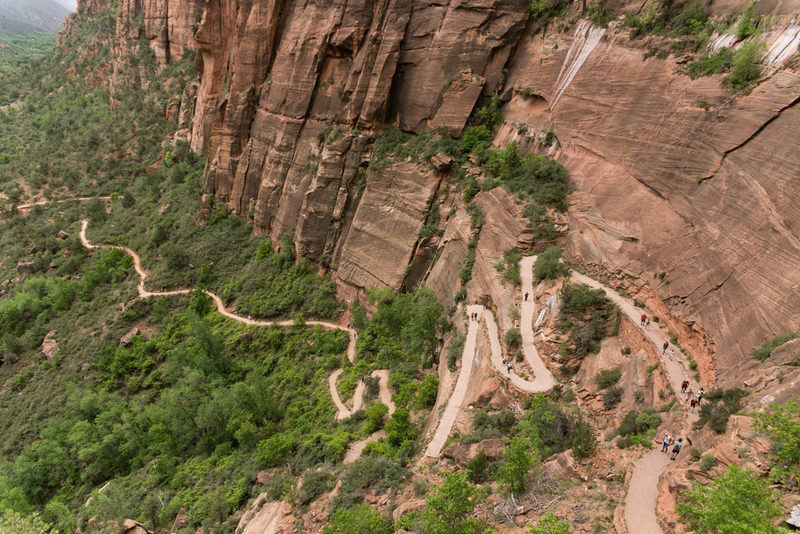 I knew I had to decide then and there if I'd be continuing to the very top of Angel's Landing, and even though my entire body said to stay back and call it a day, I promised myself I wouldn't let my fear of heights hold me down. I found a really sweet family that let me tag along with them for the remainder of the hike, and we chatted the entire way up. They made me calm down quite a lot, as talking through my nervousness usually takes away 75% of it. Most of the climb relies on steady footing, as one slip would send you tumbling into the canyon below, so each step was fairly calculated for me. About half an hour of thinking "What am I even doing?? ", we reached the very top and it was beyond worth it. I instantly grabbed my phone to snap a few photos before lugging out my real gear and realized I had the best service I'd had on the entire trip. I immediately called Rob and burst into tears (I am definitely one of those people that cries when there's just too many emotions to control, haha!). I was more than overwhelmed with how scared I was, and I hadn't talked to him much that week. He reassured me that I made the right choice and made me promise that I'd take him there someday. I shot photos, ate a quick sandwich, took some snaps of the gracious family who took me under their wing and it started raining. Everyone started to scramble back to the trail down, and everything became slippery within minutes. The hike down wasn't nearly as treacherous, but it was much easier to slip on wet sand and lose your footing. I moved quickly to get out of the rain, but was meticulous in reassuring my footing was solid before taking any big steps. I reunited with Leah after another 20 minutes or so and gave her a hug as my body was still trembling. 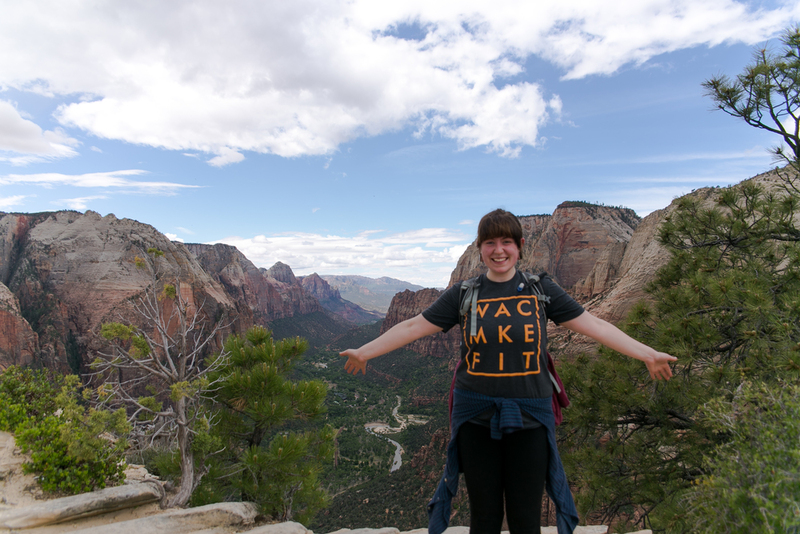 I'm so thankful she was patient with me and let me do the remaining bit of Angel's Landing! We made our way down the lookout, and eventually back to our car. After we got back to our campsite, we packed up and got back on the road to head into Arizona. I had scoped out a cheap site called Lee's Ferry Campground basically in the middle of nowhere, but it was the true essence of the desert. Deep red mesas all around and basically nonstop wind. 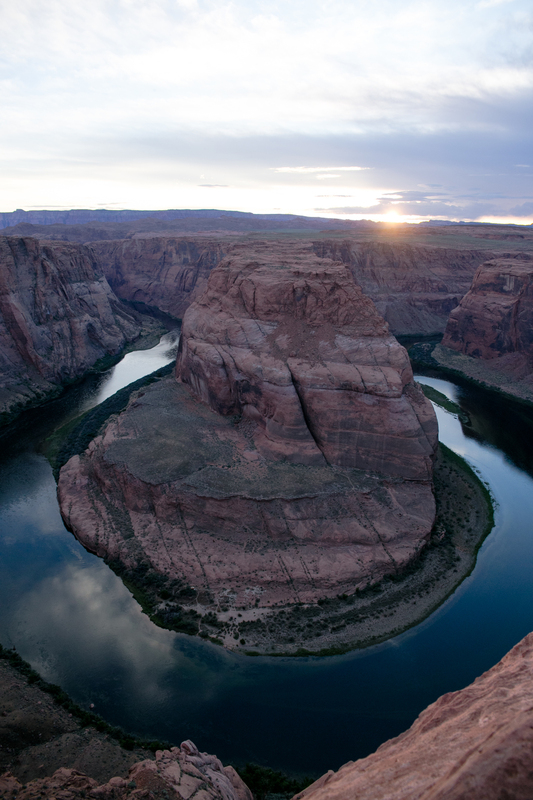 One place I needed to see, no matter how touristy, was Horseshoe Bend! It was about a 45-minute drive, and we got there at the perfect time. The sun was about to set and I got the few pictures I wanted. There were tons of photographers posted up with tripods shooting timelapses, so there weren't many angles available. I still got to see the whole bend and can check that one off my bucket list. After a quick restock of some essentials in town, we headed back to our campsite to get a decent sleep. We were both exhausted from the hike and let ourselves go to bed early and sleep in late. Day 6 was the last stop we had planned, and it just had to be the Grand Canyon. Neither of us had ever been, so we agreed that if it wasn't awesome we would head home early! 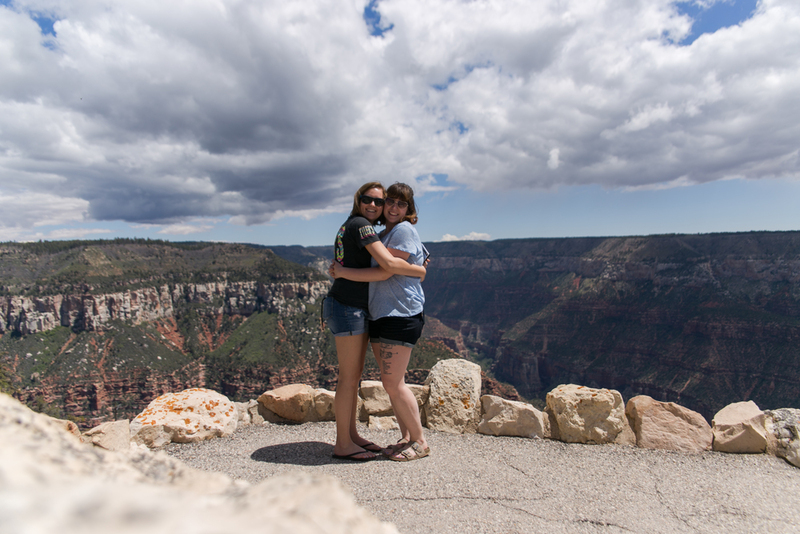 We planned to see the North Rim after a few recommendations from friends, and the drive there was way longer than we had hoped. Seriously, you drive down the same road for nearly an hour and a half just to get to the park entrance, and then even further to the decent viewpoints. All-in-all it was a pretty sight, but without any hiking trips in our schedule, it was only entertaining for 10 minutes. We started driving home towards Denver, and the following day all the way to Madison. Overall, the trip was wonderful. I enjoy waking up and going to sleep with the sun, and I missed the mountains far more than I thought I would. I know I'll live out West again someday, but for now, this will hold me over.